As the one-hundredth anniversary of the sinking of the Titanic draws closer, NewSouth Books offers a unique opportunity to hear an account of the disaster from an actual survivor of the ship. In addition to our book A Rare Titanic Family by scholar Julie Williams, which relates the account of her great-uncle Albert Caldwell and his family surviving the disaster, NewSouth is now releasing a special audio podcast in which Caldwell himself talks about his memories of that night in April 1912. Download survivor Albert Caldwell’s recollections of the Titanic disaster now, free from iTunes. When the ship hits the iceberg, Caldwell is initially assured that there’s no danger, but later his family is ushered on deck with the other passengers. Seeking more information about the ship’s condition, Caldwell and his family happen to encounter a half-full lifeboat, saving their lives. 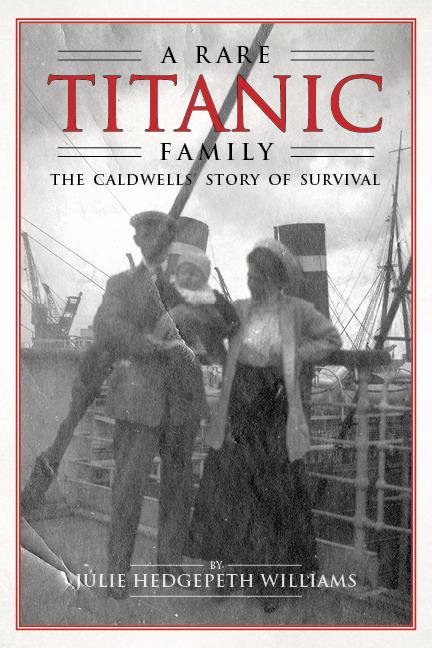 Additional information about Caldwell, including how his life changed after surviving the Titanic, can be found in Julie Williams’s aforementioned book, A Rare Titanic Family. Library Journal praises Rare Titanic Family as “a warm biography … related with obvious affection,” and a Christian Science Monitor reader called the book “gripping.” Ben Steelman of the North Carolina Star-News profiled Julie Williams and Rare Titanic Family on his “Bookmarks” blog. Publishers Weekly included the book in their roundup of Titanic titles, “Still a Night to Remember,” quoting NewSouth publisher Suzanne La Rosa who said Rare Titanic Family “stands out because the author ‘gives voice to the drama such that the human dimensions of the tragedy emerge. '” The New York Times mentioned the book in a similar list on their ArtsBeat blog. Albert Caldwell’s audio recording can be downloaded from iTunes. A Rare Titanic Family is available in print and ebook formats from NewSouth Books, Amazon.com, or your favorite bookstore. Politics is never simple, but as the current race for the White House continues to heat up, it’s nice to recall a simpler — or at least friendlier — time. 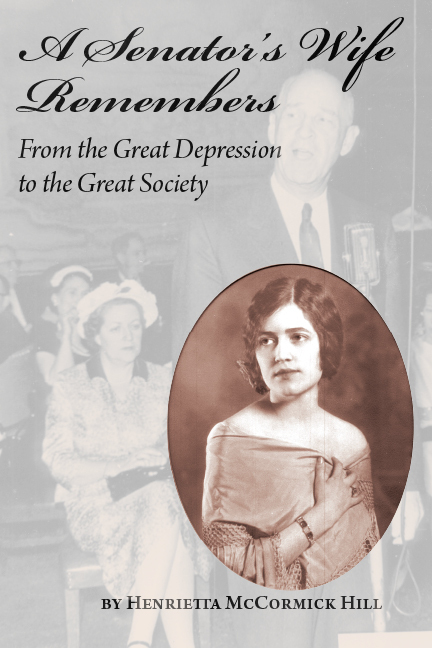 It’s for these elements that Professor Michael Thomason praises Henrietta McCormick Hill’s A Senator’s Wife Remembers: From the Great Depression to the Great Society, in a new article in the Mobile Press-Register. Hill was the wife of Alabama senator Lister Hill, and her book is compiled from diaries and letters written during her husband’s political career, collected by the Hills’ daughter. As modern political battles grow ever more bitter, Thomason points out that Mrs. Hill “is always very complimentary about the people she talks about and is quite proper in what she writes and how she describes her world. This may be the book’s strong suit. It is an honest and clearly-stated view of the world she lived in.” Thomason suggests that the book will be of interest both to general readers and those with an interest in Alabama or American political life, as well as to those studying gender or the role of women in politics. Read the full article from the Mobile Press-Register. A Senator’s Wife Remembers is available direct from NewSouth Books, Amazon.com, or your favorite bookseller. On March 1, the University of Alabama’s journalism department presented NewSouth writer Frye Gaillard with the Clarence Cason Award. Gaillard is the third NewSouth author in a row to win the prize, following Rheta Grimsley Johnson and Clyde Bolton. The award honors nonfiction that contributes to a greater understanding of the South. A native of Mobile, Alabama, Frye Gaillard has published numerous works, including Cradle of Freedom: Alabama and the Movement that Changed America, which won the Lillian Smith Award, and Watermelon Wine: The Spirit of Country Music, republished by NewSouth Books for its twenty-fifth anniversary. In 2002, he won the NAACP’s Humanitarian award for his writing on civil rights. Gaillard is currently writer in residence at the University of South Alabama. At the awards ceremony, Gaillard shared a few words about eye-opening experiences during his career. One profound instance involved interviewing the father of a girl murdered in the Sixteenth Street Baptist Church bombing in Birmingham and discovering the father’s remarkable sense of forgiveness. Another memorable, but very different, moment occurred while writing the biography of a NASCAR driver, who surprised Gaillard with his passion for reading. NewSouth will publish Gaillard’s The Books That Mattered: A Reader’s Memoir this fall. 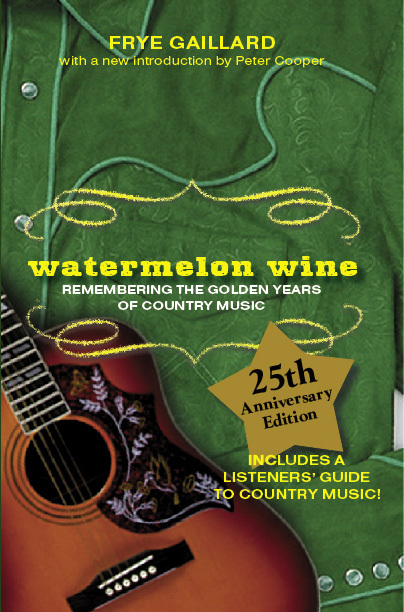 Watermelon Wine is available from NewSouth Books, Amazon.com, or your favorite retail or online bookseller. Gaillard is also a contributor to the collection American Crisis, Southern Solutions: From Where We Stand, Promise and Peril. I cannot claim to have known William Gay well. But I admired him very, very much, and my life was touched by him in more than just an abstract way. Indeed, he blurbed my second book, The Yazoo Blues. That piece of good luck came about because Middle Tennessee State professor Randy Mackin, director of the Tennessee Literary Project, put me in touch with William, who purposefully made himself difficult to contact. My relationship with William was brief and almost entirely telephonic. We enjoyed a couple of exceedingly long chats over the telephone, and as a result of those talks, I knew I really liked him and understood how unusual and perhaps how massively significant he was in terms of what, where, and when he was. I always meant to get in the car and go over to Hohenwald, Tennessee, to see William, but I never did. I should have. Still, telephone conversations cannot be underestimated. They have sustained the bond of many a friendship for decades. Plus, it is easy to hear that other voice inside a person on the far end of the line that tells us who we are talking to. And when we hear it in that way, I say it is the human analog of a hound-dog’s infallible sense of smell. Therefore, the impressive value I place on William Gay is what any writer might assign if he or she, like me, were equipped with only two marathon telephone calls — lightly reinforced on each occasion by a semi au courant awareness of the life, work, and general gestalt of the man himself. Thank God for Alexander Graham Bell. Sadly I am not one of those writers who reads everything, keeps up, and constantly reads. People often ask: “What books do you like?” And I answer: “Seinfeld re-runs.” Thus exposed I must go all the way and admit that I was first taken simply by two of William Gay’s titles. The actual titles of the titles.
. . . man goeth to his long home, and the mourners go about the streets: Or ever the silver cord be loosed, or the golden bowl be broken, or the pitcher be broken at the fountain, or the wheel broken at the cistern. Then shall the dust return to the earth as it was: and the spirit shall return unto God who gave it. During the 2009 Southern Festival of Books in Nashville, I thought I was going to see William and talk with him a little, and thank him again for what he had given me. But he fell ill in his hotel room right before he was scheduled to appear and had to go back home. Still, I was certain that pretty soon I would get up early one morning, hop in my 2000 Ford Explorer, and make the pleasant and relatively easy trip from Memphis to Hohenwald to pay him a call. But that is the nature of not doing something a person knows he needs to do. Time passes, and the day arrives when it cannot be done — that day when “man goeth to his long home, and the mourners go about the streets” . . . the day when that evening sun has gone down and there will be no more mornings in which to procrastinate. William Gay and I were close to the same age, both apparent masters of imperfection, Southerners, and writers. And though there are plenty of differences, I felt we were more alike than not — on more than just a few levels. I caught in him the artist who manages, through his art and by his craft, not necessarily to overcome all the minuses but to outfox them enough so that he is able to place upon the table of our world . . . the silver cord and golden bowl of the self. He died on Thursday, February 23, 2012. But his silver cord is not loosed, his golden bowl is not broken, and his pitcher is not cracked at the fountain — nor is the wheel on the fritz at the cistern. All those unbroken things stand for what he was and what he produced. They are in good order, and we have them at hand. By declaring this, I do not minimize the incomprehensible permanence of death nor the mind-stumping concept of eternity. Not at all. But though William Gay has gone to that long home, his intellect and talent along with the world he saw and everything that made him who he was — and in some measure who we are, too — he wrote down on paper . . . and now on that in print and also within every cybernated particle of the very electrified air around us, all of it is still here and will last as long as there are readers to receive it. And I may yet make that trip to Hohenwald. John Pritchard grew up in the Mississippi Delta, a place of dark and elemental myth that inspired him to write. He currently lives in Memphis, where he has taught college-level English — often in knickers — for most of the last thirty-two years. Barnes and Noble named his debut novel Junior Ray one of their Top Ten Sensational Debut Novels for 2005. NewSouth published the sequel, The Yazoo Blues, in 2008. The unforgettable Junior Ray Loveblood will return for a third time in the forthcoming Sailing to Alluvium. You are currently browsing the NewSouth Books weblog archives for March, 2012.